While reiterating its resolve to bring about the Himachal Pradesh Tenancy And Land Reforms (Amendment) Bill, 2010, in the interest of the people of the state, the government today agreed to refer the Bill to a Select Committee of the House in the absence of Congress legislators who have been very critical of it. Seeking a debate in the assembly on the lathi charge on Congress activists outside the Vidhan Sabha on April 9, Congress members today staged a walkout when the Speaker did not accede to their demand. The government will provide additional funds for repair and maintenance of the Theog-Hatkoti-Rohru road being upgraded under the State Road Project by a Chinese company. Questioning the wisdom of the BJP regime in spending Rs 3 crore on giving a facelift to Dharamsala in view of the IPL matches, HPCC chief Kaul Singh said today that the cash strapped government had no right to squander public money in this fashion. In a bizarre incident, one Lokeshwar Thakur (24) was injured when his uncle Ashwani fired at him last evening at Nagao village, near Kandaghat. The police after receiving information rushed to the spot and arrested Ashwani along with his gun. A case under the Arms Act has been registered. Poanta-based frozen food company Himalya International will set up the country’s largest canned soup plant at Vadnagar in Gujarat in technical collaborations with US-based Wayne Farms. The Himachal Pradesh Municipal (Amendment) Bill, 2010, and the HP Municipal Corporation (Amendment) Bill, 2010, were introduced in the state assembly today to make necessary provisions for holding of direct elections for the post of president, vice-president, mayor and deputy mayor in the urban bodies. The CPM today accused the government of diluting the Tenancy and Land Reform Act, 1972, to facilitate easy sale of land to outsiders, especially those in the field of education and building. Taking a serious note of false affidavits filed by 37 investors who had applied for consent to operate, the HP State Pollution Control Board has issued show-cause notices to them and sought reply within 15 days. While the offenders could face legal action, including imprisonment up to seven years, the step has been taken after referring the matter to the government. The state government will make efforts to get approval for the third phase of Swan channelling project at the earliest from the Union Government. This will save thousands of hectares of agriculture land for farmers of Una district. With Baisakhi festival around the corner, hundreds of commercial vehicles like trucks and tempos are entering the district with loads of passengers. The Himachal High Court and prevailing law has banned carrying of passengers in commercial or goods-carrying vehicles. However, officials of the Excise and Taxation Department are legalising carrying of passengers in commercial vehicles in the district. They are allowing such vehicles to ply by charging passenger tax from them. The Himachal government has started a campaign to extend cooperative movement to every village and household of the state so that it helps in faster economic development of all sections of society. This was stated by Himachal Vidhan Sabha Deputy Speaker Rikhi Ram Kaundal while addressing a largely attended villagers’ meeting at Kathune in Balh Seena gram panchayat after inaugurating a fair price shop of essential commodities at Mallari Sehkari Sabha, about 80 km from here yesterday. The Seedha drinking water supply scheme will be implemented with an expenditure of Rs 1.06 crore while Rs 52 lakh are being spent on the Bandla hilltop drinking water scheme which will tackle water scarcity in the area. This was stated by Forest Minister JP Nadda while inaugurating Rs 3.40 lakh panchayat bhawan at Seedha last evening. DC Abhishek Jain said 518 poly houses had been built in the district during the last financial year under Pt Deen Dayal Kisan-Bhagwan Samridhi Yojna. DC Abhishek Jain has asked executive officer of the local Municipal Committee and secretaries of the notified area committees of Naudan, Sujanpur and Bhota to give top priority to maintaining sanitation and cleanliness in their areas. Reacting to the news item published in these columns regarding unavailability of work for hundreds of villagers of the remote Beral and Mangal panchayats in the Arki subdivision under MNREGA, the Deputy Commissioner has directed the BDO to personally visit the two panchayats and submit a report. The district Vigilance and Anti-Corruption Bureau team today arrested a patwari red-handed accepting a graft of Rs 2,000 under Nadaun subdivision. It was local BJP legislator Suresh Bhardwaj who demanded that the Amendment Bill be referred to the Select Committee. He raised the issue in the assembly today when it came up for discussion in the absence of Congress MLAs who had left the House after staging a walkout. Incidentally, CLP leader Vidya Stokes and HPCC chief Kaul Singh Thakur had given their suggestions for amendment but could not take it up as they had left the House in protest against the lathi charge. “Though the intentions of the government in making Section 118 of the HP Tenancy and Land Reforms Act, 1972, more stringent and in the interest of Himachalis is very clear, there is need for serious discussion on it after which it can be debated upon in the assembly,” said Bhardwaj. Public Works and Revenue Minister Thakur Gulab Singh said the government was in no haste to bring about the amendment even though it was aimed at benefitting Himachalis. “I have no objection if the amendment Bill is referred to a Select Committee of the House as it can be taken up later,” the minister said. As such, Speaker Tulsi Ram referred it to a Select Committee. The minister said the amendment proposes to make the definition of an “artisan” more specific where a revenue officer could allow lease of land by a land owner through a registered lease deed. Later, talking to the media outside the assembly, Stokes and Kaul Singh said they wanted that the amendment should not be brought about at all as it would dilute and render infructuous Section 118. “The relaxation will only help private builders and open flood gates for outsiders, putting more pressure on infrastructure which is insufficient for existing population as well,” said Stokes. She said promoting builders and colonisers by way of multi-storeyed structures would harm the eco-sensitive areas of fragile hill ecology. Congress Legislature Party (CLP) leader Vidya Stokes raised the issue before start of Question Hour in the assembly. “The use of police force on Congress workers is a very serious issue which requires immediate discussion for which adjournment notices have already been given by myself, Gangu Ram Musafir, Mukesh Agnihotri and Nand Lal,” she said. Turning down the request of the Congress legislators, Speaker Tulsi Ram said since he had received the notice this morning only, it would take some time for the government’s reply to come in. He said the discussion could take place at a later stage when the information was received. Dissatisfied with the ruling of the Speaker, the Congress members left the House, raising slogans against use of police force to crush down peaceful demonstrations. Meanwhile, Parliamentary Affairs Minister JP Nadda lashed out at the Congress for behaving in such an irresponsible manner. “Neither does the Congress have issues nor the intention to discuss people’s problems. Hence, they are trying to disrupt proceedings and divert attention of the people from core issues,” he said. He said the government was open to discussion in the House but that could be possible only as per rules. Later, while talking to mediapersons, CLP leader Vidya Stokes said the Congress wanted the government to order an inquiry into the incident in which there was unprovoked lathi charge on Congress workers when they had dispersed after the demonstration got over. “If the government fails to do so, we will knock the doors of the court as the authorities cannot use force without any justification,” she said. She added the CLP will once again raise the issue in the assembly tomorrow as the police had not even bothered to register a case against the driver who critically injured state Youth Congress general secretary. HPCC chief Kaul Singh Thakur said on the one hand the government claimed that anyone could walk into a police station to get an FIR registered and at the same time no case had been registered on the complaint of former minister Asha Kumari. He said the government was adopting double standards on the issue as two cases had been registered against the Congress workers who were beaten up. Stating this while presiding over the meeting held here today to review the progress of various ongoing works under the State Road Projects, Public Works Minister Gulab Singh Thakur said the government was aware that the road required improvement to facilitate smooth transportation of apple and other farm produce to the markets. He said landslide-prone areas would be identified and necessary precautionary measures undertaken to avoid any inconvenience to the commuters. The department would be more vigilant during the ensuing apple season and additional funds would be provided for maintaining this important road. He said proper drainage facilities should be ensured along the roads to minimise damage due to rains. The minister said under the Rs 1365 crore World Bank-funded project, improvement of about 2435 km of state highways and major district roads would be taken up. He said Rs 238 crore would be spent on upgradation of Theog-Hatkoti-Rohru road for the convenience of apple growers of the region. He said timely completion of the road would be ensured. Stressing the need for regular monitoring of the upgradation work he said officers of the department should make frequent inspections on the whole stretch of the project. He said more dumping sites would be identified to check environment and vegetation. Horticulture Minister Narender Bragta said work should be carried out in a planned manner so that the commuters were not put to inconvenience. He said IPL matches were a purely commercial event and elsewhere in the country all state governments had charged money from the organisers for providing security and making other arrangements. “Why should the Himachal government show so much of magnanimity towards a commercial event when it has no money for its own people,” he quipped. Thakur said even the Punjab government had charged a hefty amount for the matches held at Mohali. “The government is more concerned about doling out help for the IPL matches when people are facing acute water shortage, fodder scarcity and grave crop damage,” he said. He said the amendments proposed in the HP Tenancy and Land reforms Act, 1972, would make redundant the provisions of Section 118. “Giving relaxation for sale of flats to outsiders by private builders will open floodgates for registration of voters, so the BJP regime is doing this with an eye on the prospective vote bank of outsiders,” he alleged. He said votes would be made in a similar manner, the way lifetime members were made in the Himachal Pradesh Cricket Association (HPCA). The Congress chief said the Congress would launch an agitation against the move of the government to have a state cadre rather than district cadre of JBT teachers. “The decision is aimed at giving benefit to solely two districts of Hamirpur and Bilaspur from where 50 per cent selection will be made while the remaining will go to other 10 districts,” he said. He said the move would place the people of remote and backward areas at a clear disadvantage. According to SP Prem Thakur, preliminary inquires revealed that Lokeshwar lived with his mother Leela Devi on the ground floor while Ashwani Kumar resided on the first floor of a common house. A dispute relating to crop compensation and land led Ashwani to abuse Leela Devi and after hearing this Lokeshwar came out and tried to stop his uncle from abusing his mother. This angered Ashwani who shot at Lokeshwar injuring him in his right thigh. Lokeshwar, however, went upstairs to stop his uncle and a scuffle that ensued the former broke the .12 bore gun of his uncle and threw it down. Both were rushed to the hospital from where Ashwani was arrested this morning. Chairman of the company Manmohan Mallik said the equipment would be imported from Georgia (USA) at a cost of $1.8 million and canned soup would be launched in Indian and overseas market by January 2011 under its brands “Himalya Fresh” and “Uno Italiano” and also under private labels. The company would set up the plant with a production capacity of 1,100 cans per minute of various sizes and had concluded the deal for the automatic soup canning line from its US partner and the project would be set up with an initial investment of $2.5 million, deploying about 100 trained persons. Commercial production would start by October, 2010, and company was expected to generate a revenue of Rs 120 crore by 2014 from the plant. In all 50 tonnes of vegetables would be processed per day at full capacity and inputs like mushrooms and tomatoes would be grown in house and by way of contract farming in Gujarat. The company would process cream of mushroom, tomato-basil and lentil soups at the facility. The chairman said the company proposed to launch condensed soups in cans to which equal amount of water or milk could be added providing better value to the customer. Worldwide canned soups were preferred over powder soups due to healthier profile and great natural taste. Almost 75 per cent of soup market had been captured by canned soup due to its healthier and tastier characteristics in comparison to dehydrated soups, being sold in India as dried powders till today. Transport and Urban Development Minister Mahender Singh introduced two Bills in the House. The amendments will not only bring about provisions in Section 22 of the Himachal Pradesh Act, 1994 (Act No 13 of 1994) for indirect elections of president and vice-president, but will also make provision for establishment of ward sabha and ward committee for each ward in the municipalities. Horticulture and Technical Education Minister Narinder Bragta introduced the Himachal Pradesh Technical University (Establishment and Regulation) Bill, 2010. The legislation is being brought about so that affiliation can be given to the existing government and private engineering colleges and professional institutions and to conduct counselling, certification and award of degree. The fourth Bill which was introduced in the assembly today was the Himachal Pradesh Industrial Establishments (National and Festival Holidays and Casual and Sick Leave) Amendment Bill, 2010. The Bill was introduced in the assembly by Industries Minister Kishan Kapoor. In a statement issued here today, Member, State Secretariat, Tikender Singh Panwar, said the move was aimed at uprooting peasantry in the state at a time when they were under tremendous burden. “How can the chief minister, who is demanding a separate policy for hill states, go ahead with amendment in the Tenancy and Land Reform Act which is against Himachalis,” he questioned. 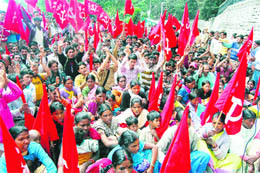 Panwar said the CPM would oppose any move aimed at dilution of section 118. He added that the party would represent the case of the people before the Select Committee, to whom the Bill has now been referred. It is worth mentioning that 37 such cases had been unearthed by the board, including 19 in the Baddi-Barotiwala-Nalagarh (BBN) area, eight in Paonta area, one each and Una and Kangra and 10 in Parwanoo industrial area. With the proposed investment of these units being almost Rs 97.58 crore in the BBN alone, one could well estimate the gravity of fraud which these units were planning to swindle by accruing various benefits under the central industrial package. Other proposed investors who had been served notices included Shkshan Genset, Punjab Engineering, Abhishek Pharma, Xaltd Information Systems, Shri Guru Kripa Udyog, Verma Glass, Esteem Projects, Sai Nara Home Appliances, Scott Edile pharmaceuticals, Seicneus Medipole, Sunnox International, Niple Industries, Icomm Telly Limited, JK Concrete Technologies, Aman International, Jai Gurudev Print o Pack, Wings International and Fontec Polymers in the BBN area. Chief Minister PK Dhumal said this while addressing a public meeting in the Santokhgarh area of the district today. He earlier dedicated Milkfed plant at Lalsinghi completed at a cost of Rs 1 crore to the people of the area. About the Swan channelling project, he said Rs 108 crore had been spent on the construction of first phase of Swan River Channelling Project and Rs 235 crore had been approved to extend it further. He said on completion of second phase, the state government would take up third phase to complete the channelling of the entire Swan river. He also inaugurated a bridge over Lalsinghi rivulet, completed at a cost of Rs 1.52 crore and new bus stand at Santokhgarh completed at a cost of Rs 68 lakh. The state government was trying to open a medical college and another university in the private sector in the district. Rs 73.37 crore has been spent on various buildings and road projects in the area, Dhumal said. The Chief Minister announced Rs 1.36 crore for Santokhgarh sewerage, Rs 20 lakh for water supply scheme, Rs 85 lakh for Mehatpur sewerage scheme completion and Rs 2.58 crore for improvement of Ajouli-Santokhgarh road. He assured people that work on inter-district bus stand at Una would be carried out on priority to facilitate local and other commuters. Rs 2,75,87,000 has been approved for various water supply schemes in the district, Rs 50 lakh for Kala Kendra at Una and Rs 53 lakh for dairy development scheme for Una, he said. Satpal Singh Satti, chief parliamentary secretary and local MLA, welcomed the Chief Minister and thanked him for adding two important milestones. He said foundation stones worth about Rs 50 crore were laid during the past two years in his home segment. Social Justice and Empowerment Minister Sarveen Chaudhary, Zila Parishad chairman Balbir Bagga, Milkfed chairman Mohan Joshi, and Water Management Board vice-chairman Parveen Sharma were among others present at the function. The Chief Minister is also scheduled to inaugurate the Sombhadra festival in Una district later in the evening. With Baisakhi festival around the corner, hundreds of commercial vehicles like trucks and tempos are entering the district with loads of passengers. 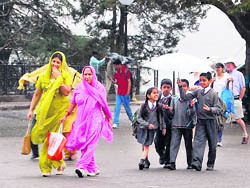 The Himachal High Court and prevailing law has banned carrying of passengers in commercial or goods-carrying vehicles. However, officials of the Excise and Taxation Department are legalising carrying of passengers in commercial vehicles in the district. They are allowing such vehicles to ply by charging passenger tax from them. The Tribune has, in its possession, the receipts of passenger tax charged from a large number of commercial vehicles carrying pilgrims or passengers by Excise and Taxation Department officials of Una district. As per the receipts available with The Tribune, the tax has been charged at the rate of Rs 280 and Rs 20 as surcharge from commercial vehicles carrying passengers illegally. 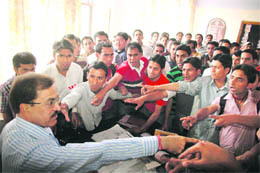 Interestingly, Chiranji Lal Chaudhary, a resident of Dhandari village under the Takarala panchayat, had sought information under the Right to Information (RTI) from the office of Assistant Commissioner, Excise and Taxation, Una, regarding the amount collected as passenger tax from goods-carrying vehicles. In reply to his query, the department had maintained that no such tax was being collected. The Tribune, reveals different facts. Counsel for RTI applicant, Seema Sharma, while talking to The Tribune, said either Excise and Taxation Department officials had given wrong information under the RTI, or the tax collected had not been deposited in the government treasury. She said since they had the receipts of the tax collected, an appeal would be filed against such officials for supplying wrong information. Since the high court has ruled against carrying of passengers in commercial or goods carrying vehicles, the officials were committing contempt of court by legalising such activities, she said. 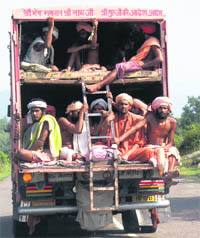 Carrying of passengers in commercial vehicles leads of accidents almost every year. This year also in Mairi mela, organised in Una district in March, three persons were killed and many others injured when a truck carrying passengers overturned. The Una police has been writing to their counterparts in Punjab to stop the same. However, the practice has been continuing unabated. The officials concerned should challan the commercial vehicles carrying passengers under the appropriate provisions of the Motor Vehicles Act. Excise and Taxation Assistant Commissioner was, however, not available for comments on the matter. Kaundal said this shop would provide facility of cheaper essential commodities to 2,018 persons of the area. He said 196 cooperative societies, 156 fair price shops, 154 food supply depots and 74 agriculture cooperative societies were serving people in the district here with membership of 74,563 persons and securities worth Rs 51.23 crore. The Deputy Speaker was appreciative of the fact that the entire ration distribution system in the district was under the control of cooperative societies. He said Rs 53 lakh would be spent on tarring of the Kathune-Gajrehada road and Rs 60 lakh on the Ghandhir road. Cooperative Society president Devender Singh and secretary Nardev Singh also addressed the function. He said Rs 1.60 crore were being spent on the Kahvi link road, Rs 52 lakh on tarring of the Bandla-Seedha road and Rs 3.84 crore on the Dhamna-Markand-Kathpur road. Nadda also inaugurated 2-km-long “Van Vihar” at Bandla mid-hill near the town here and said this walking track would provide clean environment for citizens and students. The Forest Minister also inaugurated a parking lot on the ground and first floor of the under construction IDSMT commercial complex being constructed under the flagship of the nagar parishad in the main market here in the town. Presiding over a review and extension meeting today at Sachuhi, which was organised at the grass-roots level for the first time, Jain said farmers were given 80 per cent subsidy of Rs 382.2 lakh under this scheme. He said poly houses had been established on total 6.29 hectares and the farmers were given a subsidy of Rs 175 lakh for construction of 619 micro-irrigation schemes providing irrigation facilities on 430 hectares of land, besides giving a subsidy of Rs 6 lakh for construction of water sources. Giving details of the works carried out during the current fiscal year, deputy director (Agriculture) AS Rana said a target of building 550 poly houses for which Rs 435 lakh were to be given in subsidy and bringing 900 hectares of land under micro-irrigation systems was set. He said a mobile soil testing van had been made operational in the district for on the spot testing of soil in every village. Total 16,275 soil health cards had been issued after testing 10,519 soil samples, 16 community tanks were built, 26 personal tanks have been constructed with the cost of Rs 9 lakh and Rs 24.5 lakh were given in subsidy to 12,877 farmers for producing vermicompost. The DC asked them to build a proper mechanism for collection and disposal of solid and liquid waste in these areas and said most of the villages in the district were ODF (open defecation free) but little progress had been made in the urban areas in this regard and stressed the need of taking immediate steps to keep the environment clean. DC Amar Singh Rathode told The Tribune that he had directed BDO Rohit Rathode to meet the affected people and inquire as to why no work was undertaken under the centrally sponsored scheme. Mangal panchayat pradhan Deep Chand admitted that 150 to 200 cards had been made under MNREGA at his panchayat a year ago but he had not received any job application. The BDO confirmed that only work worth Rs 6 lakh had been executed at Mangal panchayat and that he had directed the panchayat secretary to motivate villagers to come forward. Villagers, however, alleged that their applications were not entertained and they were returned empty handed. They also said they were without any work for several months now.